Brand new and highly unusual! The world's first ever Pinkberry! Delicious, juicy Super Fruits, packed with vitamins, minerals and antioxidants. Perfect eaten fresh from the bush with ice cream, or in yummy summer puddings! Fruits reliably each year in late August. Fiery orange foliage display in autumn. Own something brand new and unusual the worlds first ever Pinkberry and pick your own crop of delicious fruit each year from next season! 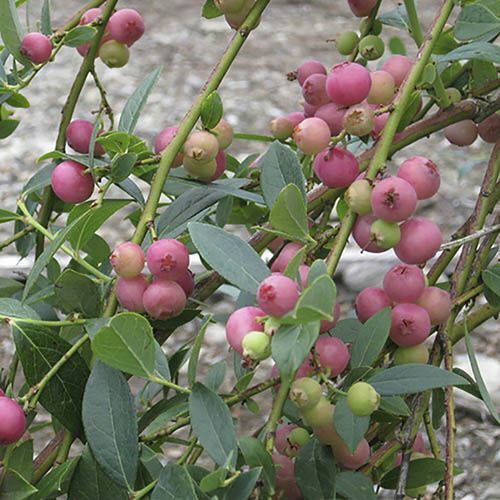 From the blueberry family, these lovely fuchsia-pink coloured Superfruits are packed with healthy antioxidants and, best of all they are sweeter and juicier than regular blueberries. Put them into your summer puddings or eat them fresh from the bush with some ice cream scrumptious! Pink Blueberry 'Pink Sapphire' reliably bears fruit and which is ready to eat in late-August each year. These incredible plants will even provide an explosion of fiery-orange coloured autumn foliage. Theyll grow into a bush of about 90cm (3ft), and grow best in acidic or ericaceous soils, like all members of this family. Supplied as an established, 30-35cm tall plant in a 3L litre pot, ready to plant all year. Will grow to approx. 90cm (3ft) tall. Plants supplied between November and March will have no leaves, as the plant is deciduous. Use ericaceous (acidic) compost for best results.